This ground floor flat has a nice layout with the extended open plan kitchen / reception space at the back leading out onto a lovely garden with good open aspect and useful gated access from the secure alley way, which runs parallel to Valetta Road at the back. There are two good double bedrooms occupying the front and middle rooms, with refitted bathroom and an entrance hall with storage. This property is available immediately and is desirably positioned in this quiet and friendly street, a few minutes walk from the ever improving shops and cafes of Askew Road. Wendell Park and local primary schools are close by, as are the transport hubs of Hammersmith and Westfield. The 607 bus route east along Uxbridge Road provides the fastest access to the Central Line tube and Stamford Brook or Turnham Green Terrace tubes are an approximate 10 to 15 minute walk. 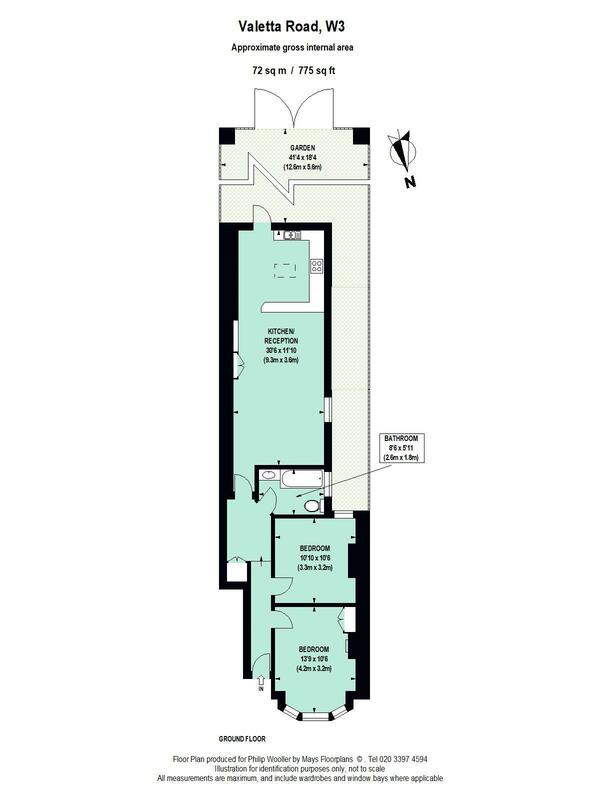 775 sq ft / 72 sq m approx.